IHB Electric is a global supplier to the power generation, industrial, oil and gas and mining industries, offering a complete range of generators and electric motors. Our market sectors include renewable energy (hydropower plants), industrial manufacturing and processing (pumps, fans, agitators, mixers and conveyors). IHB Electric’s extensive production includes the following configurations: low and high-voltage (up to 24kV), horizontal and vertical mounting, polarity from two to 32, air and water heat exchangers, as well as various degrees of protection and mounting. IHB Electric has more than 65 years of experience in the design and manufacture of electrical rotating machines to meet the needs of an ever-changing market through a global support structure of sales, service and distribution offices. 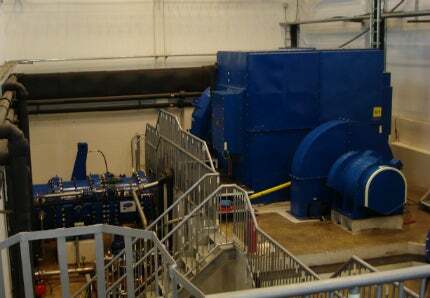 Our hydro generators have a robust design and construction, high-efficiency and long operational life, thanks to our experience using of modern technologies and high-quality materials for an optimised manufacturing process, as well as IHB Electric’s permanent monitoring and control of every manufacturing stage. We implement and use the proven insultion systems Global VPI and Resin Rich. Our three-phase low and high-voltage electric motors are suitable for general industrial applications as well as for pump stations, the mining industry and other heavy-duty processing and manufacturing applications. IHB Electric’s motors are executed with a squirrel-cage rotor or with slip-rings, horizontal and vertical mounting, as well as with various degrees of protection and cooling. We offer all active parts for generators with a rated power up to 300MW, including stator segments for the stator core, complete stator cores, stators winding up to 24kV, stator bars up to 24kV, rotor segments for rotor poles, rotor coils, rotor poles and rotor rims. They may be offered as new parts or a repair of existing ones. We offer the turnkey delivery of electro-mechanical equipment for pump stations. The delivery includes all main units pump aggregates, low and medium-voltage cables, switchboards, switchgears, water pipes, lifting cranes and everything else necessary for the safe operation of a station on turn-key basis. IHB Electric offers reverse engineering services that need repairs using our proven experience in the field of rotating electric machines. Our engineers will also prepare documentation with all technical data and drawings. Thanks to our developed knowledge, protected with patent #65201-2007, we offer rehabilitation of hydro generators with an increase of efficiency and energy parameters. This effect is achieved by applying an insulation, which during factory testing, can withstand a voltage of 40kV. By using this technology, we have rehabilitated more than 25 hydro generators with a rated power of between 4.5MVA and 235MVA, rated voltage between 6.3kV and 19.5kV, and have increased the energy efficiency with up to 14.2%. Our electrical testing services include consulting, defect detection, control and electrical testing of electric motors and hydro generators in our own electric laboratory. The main tests include full load testing, locked-rotor testing, thermography and polariation index tests. With machining and processing, our factory equipment offers a wide range of services for both medium and large-scale machining and processing. AC and DC motors rewinds and repair. Our main field services include annual preventive maintenance, installation and commissioning of equipment, diagnostics and testing, emergency support and spare parts management.